Thesis submission is closed. 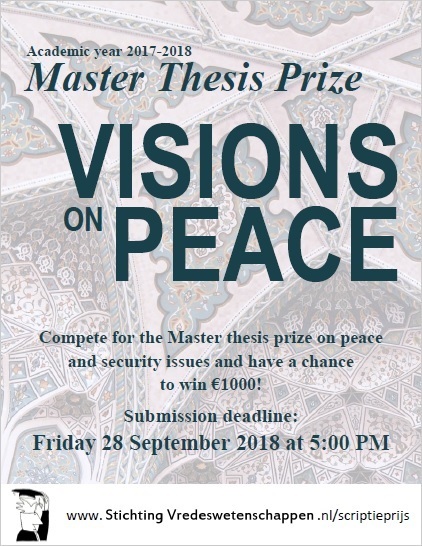 Keep an eye out on the website for more information about the Visions on Peace master thesis prize 2019. Did you write you master’s thesis on peace and security issues? If so, you can compete for the thesis prize “VISIONS ON PEACE” and have a chance to win 1000 Euros! It is the first time that you participate in the “Visions on Peace” thesis competition. To ensure that the assessment of the jury is as objective as possible, do not include any personal details of yourself, your supervisor(s) or your university in the summary, table of contents or the full thesis. Make sure to pay sufficient attention to your summary, this is the basis on which the jury makes the first selection! The social and scientific relevance of your thesis. If the above mentioned criteria are not met, your submission will not be taken into consideration. The jury is unable to provide individual feedback on the selection process. Send the application form and the required documents before Friday 28 September 2018, 5 PM Dutch time (final deadline!) to visionsonpeace2018@gmail.com. The jury will announce the shortlisted theses by the beginning of December 2018. Those shortlisted will be asked to give a short presentation of their research during the annual symposium of the Dutch Foundation for Peace Studies in December. More information on the annual symposium will follow after summer. The Dutch Foundation for Peace Studies has awarded the annual Visions on Peace Master Thesis Prize since 2008. It aims to stimulate research into peace and security issues, by (graduated) master students from universities or other institutions of higher education in the Netherlands. De scriptieprijs werd uitgereikt door Ewoud Goudswaard, directeur van de ASN Bank, tijdens het jaarlijkse SVW symposium, samen met de HBO Peace in Practice Award. De jury bestond in 2016 uit Tom Sauer (voorzitter, Universiteit Antwerpen), Erin Wilson (Rijksuniversiteit Groningen), en Lidewyde Berckmoes (NSCR Amsterdam). Zie juryrapport-scriptieprijs-visions-on-peace-2016 voor hun beoordeling. De winnares van de WO Scriptieprijs Visions on Peace 2015 was Bareez Majid met haar scriptie “In Order Not to Forget” – A Critical Study of the Iraqi-Kurdish Museum of Amna Suraka, voltooid aan de Universiteit Leiden bij Middle Eastern Studies. Haar samenvatting is hier te lezen: Summary MA Thesis Bareez Majid. De winnares van 2014 was Nina Bode. In 2013 won Eveline Wong.